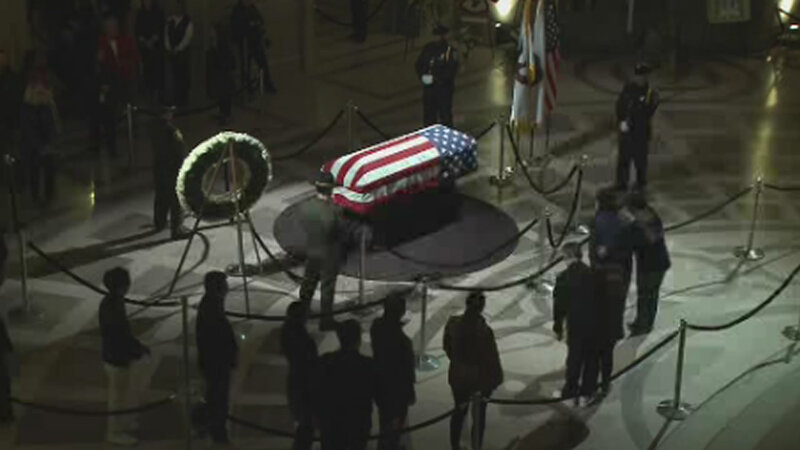 SAN FRANCISCO (KGO) -- Thousands are preparing to say their final goodbyes to the late Mayor Ed Lee on Sunday during a memorial service. On Friday people waited in a line half a block long outside San Francisco City Hall to view the closed casket of the late Mayor Ed Lee. Several declined to be interviewed, saying they were city or state workers who just wanted to say goodbye to the boss one last time. Randolph Harris, a 56-year-old retired city and county social services worker, says he was "devastated" to learn of the death of Lee, who died Tuesday after collapsing at a supermarket Monday night. Matthew Saccomanno, a 20-year-old nursing student at San Francisco State University, called the mayor "a great man with a great heart." He did not know Lee personally but says his brother works at a nearby diner that the mayor frequented. Tune in to ABC7 News for full coverage of the memorial service for Ed Lee. Click here for more stories, photos, and video on Ed Lee. The Associated Press contributed to this post.